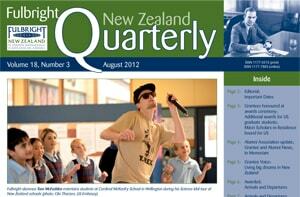 The August 2012 edition of our Fulbright New Zealand Quarterly newsletter is online now! 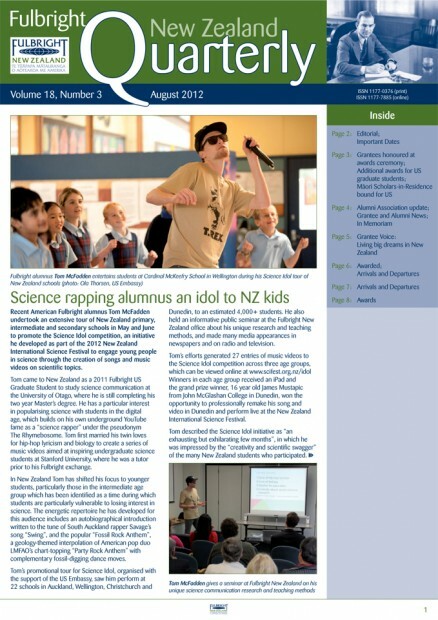 In this issue, read about science-rapping American Fulbright alumnus Tom McFadden’s promotional tour for his Science Idol initative; our recent Fulbright New Zealand awards ceremony and alumni reception at parliament; the newly-created Fulbright-ANZA US Graduate Awards; and a Māori artist and Māori academic who will be Fulbright Scholars-in-Residence at US institutions this year. Current Fulbright US Graduate Student Jessica Hinojosa reports of her exchange to New Zealand, alumnus Douglas Pratt discusses the persistence and problem of religion, and we have the usual news updates from the Fulbright New Zealand office and the Fulbright New Zealand Alumni Association, details of our latest grantees, grantee and alumni news in brief, and a full list of available awards.